AWC has a free program designed to meet the needs of Code Officials. Complete the form to receive more information on the program designed for you. Modern technology helps to simplify our daily lives in many ways with the touch of a button—and now, today's technology plays an important role in the way the wood construction industry is improving speed, efficiency and safety, and even compliance with the latest building codes. There is no mystery as to why the public relies on modern building codes to ensure safety and protection against potential hazards caused by fire, high wind, seismic or snow events. The regulation of building construction has become an increasingly efficient way to avoid unfortunate consequences of building-construction failures. That said, determining building code compliance can often be a tedious and time-intensive task for contractors, builders, and code officials. To help make the process more user-friendly, the American Wood Council (AWC) has developed four free, web-, mobile- and tablet-based applications to streamline the process of ensuring new and existing buildings comply with the latest building codes. Each application – including the Span Calculator, Heights and Areas Calculator, Connection Calculator and Energy UA Calculator – features a seamless interface with drop down menus offering a wide variety of specifications to choose from. All are available for browsers, as well as iOS and Android devices. The Span Calculator: The Maximum Span Calculator for Wood Joists and Rafters performs calculations for all species and grades of commercially available softwood and hardwood lumber as found in the 2012 National Design Specification® (NDS®) Supplement. Common uniform loading conditions are available and adjustment factors for wet service conditions even allow calculation of deck joists. The "span options" calculator allows selection of multiple species and grades for comparison purposes. The Heights & Areas Calculator: The Heights and Areas Calculator provides users with an app-based approach to calculating maximum heights and areas for buildings of various occupancies and fire protection based on 2006 to 2015 editions of the International Code Council's International Building Code® (IBC®) provisions. Input a given building geometry, site conditions (e.g., open frontage), type of construction and occupancy, and allowable heights and areas can be determined. The Connection Calculator: The Connection Calculator provides users with an app-based approach to calculating capacities for single bolts, nails, lag screws and wood screws per the 2005 NDS for Wood Construction. It offers a convenient way to determine both lateral and withdrawal connection values and includes adjustment factors for temperature, wet service, varying load durations and end grain. Additionally, single and double shear capacities can be determined, as well as wood-to-wood, wood-to-concrete and wood-to-steel connections, using a variety of solid sawn lumber and glulam species and wood structural panels. For connections loaded in shear, the calculator presents results for each of the NDS-prescribed yield modes, and calls out the controlling result. The Energy UA Calculator: The Energy UA Calculator computes an opaque wall or fenestration U-factor based on the Total UA alternative compliance method permitted by the International Code Council's 2012 International Energy Conservation Code (IECC) or International Residential Code. The U-factor indicates the rate of heat loss of a wall assembly. The lower the U-factor, the greater a wall's resistance to heat flow and the better its ability to control heat loss. This new Energy UA Calculator is consistent with AWC's Design for Code Acceptance (DCA) 7, "Meeting Residential Energy Requirements with Wood-Frame Construction." DCA 7 and the accompanying app provide ways to economically meet the residential energy requirements of the 2012 IECC. The app also gives insulation requirements needed in various wood wall assemblies to achieve the specified opaque wall U-factor. Now more than ever, complying with the latest building codes is crucial for ensuring safety, health, resiliency and energy efficiency in wood construction. According to the Environmental and Energy Study Institute1, building codes can now offer enhanced protection against the threats of natural disasters to make communities more resilient, sustainable and livable for future generations. Modern codes provide the industry with a baseline for estimating and managing risk when it comes to investing in long-term measures to achieve environmental goals that can impact short-term profits. 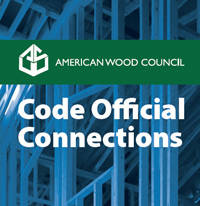 AWC's Building Codes and Standards team works closely with model, state and local building code organizations, as well as with many standards developing groups, to gain the broadest appropriate acceptance of wood products in the marketplace. AWC's easy-to-use applications help users ensure code compliance from the convenience of their smartphone or tablet – taking full advantage of the possibilities enabled through today's technology. To learn more and download the applications today, visit www.awc.org. The ICC does not endorse and has not reviewed the technology described above. Views and opinions expressed in this article are those of the American Wood Council and do not necessarily reflect those of the International Code Council, or Hanley Wood.